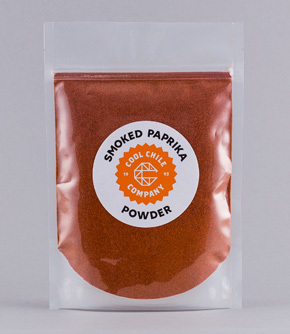 Sweet smoked paprika made from dried ground smoked Spanish peppers. Bright red paprika powder has a distinctive smoky sweet flavour. Use to season soups or stews, or sprinkle over roasted vegetables or fried eggs. Mix smoked paprika powder together with salted butter until well combined and slather over just boiled corn on the cob; peel and chop potatoes into small cubes, parboil and then fry in oil until crisp, seasoning with smoked paprika powder and sea salt.